Don't look out your window right now. I'm begging you. It's gotten to the point where the ice is so ugly, and has been here for so long, that people given up on even Instagramming it. That's a very serious level of "giving up on life"! (If you live somewhere warm right now, this doesn't apply to you, and also I hate you.) Instead of beholding Jack Frost's nightmare, I invite you to pretend, if only for a minute, that you are in Japan, staring at the much celebrated and beloved sea of blue flowers in Hitachi Seaside Park. It is perhaps the hope that we all need to remember that Spring will come again, as we struggle to will ourselves to survive the peril of watching our own snot freeze on our faces one more time. Hitachi Park is nestled by the seaside in Japan. Every few months, the rolling hills of the park erupt with an entirely new set of nemophila blooms that will basically make you want to buy a one-way plane ticket out there without so much as saying goodbye to the slushy, old pile of snow outside your doorstep. 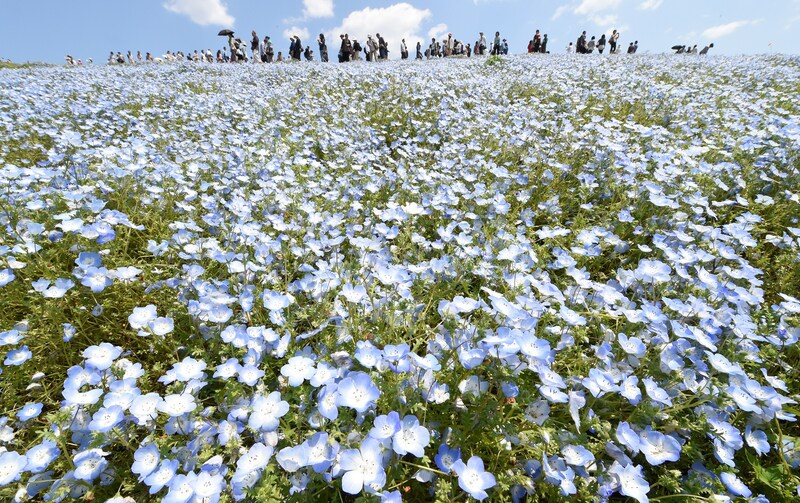 The most famous are the "baby blue eyes," a spread of 4.5 million flowers that bloom in April during an event called the "Nemophila Harmony." Tourists come from all over the world to gaze at the remarkable, translucent blooms, which cover so much of the landscape that they look like their own sea.